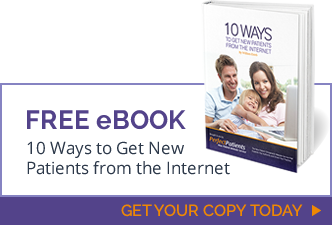 When prospective new patients arrive at your Perfect Patients website because of superior Search Engine Optimization, the first thing they notice is its design. While website visitors ultimately want content, they will often unconsciously judge the quality and authority of your content by these five components. So we take design very seriously. You should too. Creating your one-of-a-kind Perfect Patients website starts with choosing the “skeleton” for your site. Like in the human body, structure determines its function. Tell us your preference. Our designers will then organize your site and arrange the key elements in a design that is contemporary and professional. The second thing potential new patients visiting your site notice is the colors you choose. Do you prefer warm colors that communicate compassion and energy, or cooler colors that suggest precision and scientific accuracy? Certain colors work better on the web than others. We’ve collected the most pleasing combinations and posted them to our online gallery so you can’t go wrong. Express your preference, create your own combination or direct us to match the colors of your business card, signage or current practice graphics. Photography – Make sure there are plenty of high quality pictures (with captions) and that they are optimized to load quickly. Here are some helpful photo tips for chiropractors. Icons – These graphic “shortcuts” improve readability, enhance navigation and make your site more intuitive to use. Video – The Internet is morphing into television! Many believe that Google and other search engines more highly rank sites with video. 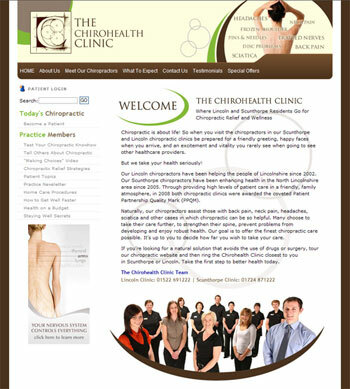 This is where Perfect Patients website design is proudly old fashioned. Rather than reinvent the wheel and risk confusion and frustration, we rely on a very simple, straightforward navigation scheme. Simple. Intuitive. And easy. Our design philosophy is based on a powerful motto: don’t make visitors think! The result is an elegant user interface that provides instant access to hundreds of content-rich pages that reside below the level one navigation structure. If you study the design of the busiest sites on the web, you’ll notice they have many “access” points. This allows visitors to explore the site based on their particular interest and customize their browsing experience. How do you have multiple entry points on the home page while maintaining a sense of order and organization? Great designers. Every Perfect Patients website is as unique as you are. Check out our Favorite Sites page to see what some of your peers have done with their Perfect Patients site design! Go one step further by upgrading the look of your site with Premium Options when only the very best will do. We take design very seriously. Because on the Internet, those who are not yet patients, size you up and form an opinion about you based on the look and feel of your website. Your website is a surrogate for the quality of care you deliver. Ready to get started? Download a copy of our simple Service Agreement and put Perfect Patients to work for you and your practice today.